Advanced Football Analytics (formerly Advanced NFL Stats): Should the Seahawks Have Kicked or Thrown? At halftime, SEA trailed ATL 24-7. They managed an improbably 2nd-half comeback to within 2 points, trailing 30-28. 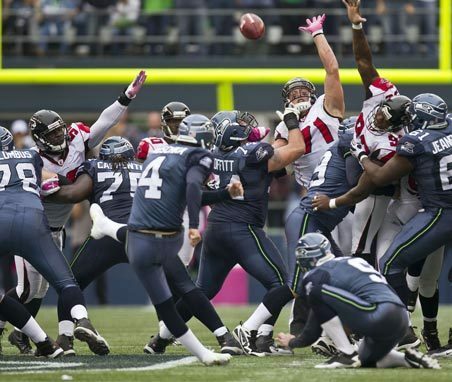 SEA moved the ball into ATL territory in the closing seconds, but faced a 4th and 8 at the ATL 43 with 13 seconds left on a stopped game clock. SEA still had one timeout. They had enough time to risk a pass that could have dramatically improved their FG chances if successful. Instead, they chose to attempt a 61-yard FG. Was this the right call? FG accuracy really falls off a cliff when the LOS is outside the 35. At very best, SEA could hope for a 20% shot from 61 yds, and that's very generous, allowing for solid footing and good weather. We can typically expect 4th and 8 conversion attempts to be successful 37% of the time in that part of the field. SEA had a TO remaining, which means they could use the middle of the field. ATL would have to guard deep against a game-fatal TD, so I would put their chances at 37% at a minimum. A successful conversion means the LOS would be at the 35 at least, making the kick a 50/50 proposition at least. 0.37 * 0.50 = 0.19 WP at least. 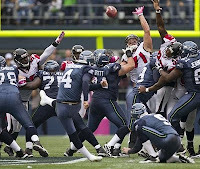 Obviously, SEA should have passed because they missed the kick. Just kidding. You could make a case either way. The local conditions--kicker pre-game distance, wind, the fact that Tavaris Jackson is your QB--would all come into play. Personally, I would have attempted a conversion then kicked, given how generous my assumptions were in favor of the kick-now strategy. Great stuff as usual. If your kicker's name doesn't rhyme with "blanikowski" then trying the 61 yarder there is probably a bad move. Yes, but if your quarterback's name rhymes with "javaris tackson", then maybe you reconsider. It shouldn't be overlooked that the Seahawks were facing 4th down because they used 1st down to spike the ball. Easy to say it in retrospect, but I'm inclined to call that a mistake. If they had used their last timeout (which they wound up never using) after the previous play, they would've had a first-and-ten at the Atlanta 45 with about 35 seconds left. Instead, they had a second-and-ten with 22 seconds left, and a timeout. Also, the play-by-play log indicates that Seattle used their first two timeouts much earlier in the second half (and neither of them were failed replay challenges). Anybody remember why? The first two time outs were used due to the defense having issues getting players on and off the field on crucial downs. Spiking the ball instead of using the timeout leaves the possibility for a play down the middle which changes the whole defense. So that might not have been a bad idea. I wonder why no team has invented a play that involves running to the line and then running a play. The defense would be incredibly confused and if it results in an incomplete pass then you probably lost 2 seconds more than a spike. maybe it would result to easily in a sack. I can't remember the last time the Pats spiked the ball to stop the clock. I'm sure they're not the only team either. Its very simple to have a play called for those types of situations and then just run it. I assume most of the time it is younger/less talented QBs that need the extra time to compose themselves and/or never run a hurry up offense in regular play that have to spike the ball. Good points. I kind of ignored Seattle's third option—getting to the line quickly and running a play—because their quarterback is Tarvaris Jackson. But he is a highly-paid professional who's been in the league for six years, after all, so I don't think it would've been too much to ask. Especially since (if I'm remembering the sequence right) there had just been a booth-initiated review which, in theory, should have given them plenty of time to regroup and plan out their next few plays. Put it this way. I think there's plenty of room for discussion about which strategy would've given Seattle the best chance to win, but I'm a Falcons fan, and I was definitely happy to see the Seahawks give up first down to stop the clock. My issue with Pete Carrol's decision is that, if he was going to try the kick from there, why on earth didn't he call a running play on the previous down? Atlanta must have been anticipating a pass play and a run may have gained a substantial number of yards. But regardless, every yard gained would have increased the chance of the kick being successful. I agree with Anonymous above about the running play idea - this same thing applied in the Raiders-Bills game in Week Two; the Raiders did back-to-back pass plays that were incomplete while the middle of the field was open for a good 15 yards (Bills only rushed 3 both plays) and McFadden stood around uselessly blocking air in the backfield... followed by them taking a timeout to the locker room with them when they lost by 3. That said, this article points out a 37% chance of getting the first which would lead to a 50/50 chance of hitting the field goal. That means that statistically the odds of this being successful would actually be 18.5% (not even counting how many seconds the average 4th and 8 play takes), so to posit it as the more likely to be successful scenario over a 20% field goal from the 61 is misleading. I don't understand that logic at all. There's no need to figure in chance of getting a 1st down at all. You compare the probabilities for gaining x number of yards and what that does to the chance of making a FG try. For example maybe there was a 50% chance of getting at least 5 yards (not unreasonable imho) in which case the FG try would have been much closer to 50%. That would seem to give something close to a 25% chance for points. I know that's fuzzy and sorry for not crunching the numbers but I'd be surprised if it didn't result in an increased chance winning the game. Further, if the run play (on 3rd down) DOES get the First, there is still quite possibly time to run one more pass play to the sidelines or end zone. If you factor those probabilities in I would be even more surprised if going for the 61 yard attempt was the better or even equal call.